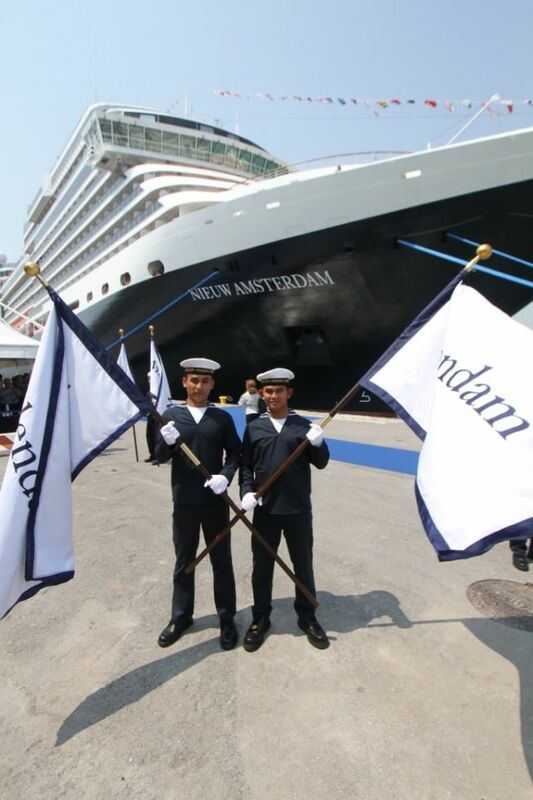 Named in Venice, Italy, Holland America Line’s Nieuw Amsterdam entered service in 2010. Holland America’s (HAL) largest and newest ships, the 2,104-passenger Nieuw Amsterdam debuted in 2010, two years after sister Eurodam. Both are able, just barely, to transit the Panama Canal. 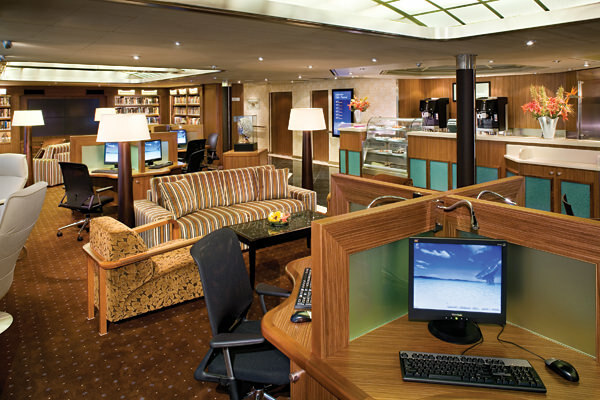 The Exploration’s Cafe is the perfect place to settle in with a great book and a latte. Photo courtesy of Holland America Line. Entertainment venues include a three-deck showroom, plus a disco, casino, sports bar and Ocean bar at the top level of the three-deck atrium. The piano bar is one of the most popular night spots and options also include the mellow Explorer’s Lounge for drinks or coffees. There’s a dedicated movie theater complete with popcorn and comfy leather seats, and the Crow’s Nest lounge at the top of the ship is a night club with live music at night. By day the Crow’s Nest opens up to the adjacent Explorations Café, where you can savor panoramic views from the Internet stations while sipping a cappuccino and nibbling on a cupcake or other pastries. Staying on top of another trend — quiet adults-focused patch of sundeck — The Retreat sunning and relaxation area is located a deck above the activity of the main pool area. Aside from the standard chaise lounges for sunbathers, there are also 14 tented cabanas (plus 8 more by the Lido pool) for rent. The semi-private hideaways are equipped with iPods, Evian water, chilled grapes, fruit trays, champagne, and chocolate; plus light breakfasts and lunches are also provided for renters. In Retreat, there’s also a large new LED movie screen adjacent to the pool bar and pizzeria. The ship’s Greenhouse Spa is well equipped and offers a hydrotherapy pool and thermal suite, while the fitness center is also state-of-the-art. Active types can play some basketball or volleyball up on the sports deck or exercise with a walk around the one-third-mile-long panoramic Promenade Deck. Eight different places to eat include three new venues: the Pan-Asian Tamarind (where you can dig into delish dishes like wasabi-soy-crusted beef tenderloin and roasted Peking duck), the family Italian Canaletto (dinner only), and the 24-hour Slice pizzeria, adjacent to the Sea View pool aft of the Lido. Besides the grand main restaurant, there’s also the Pinnacle Grill and Lido buffet venue. 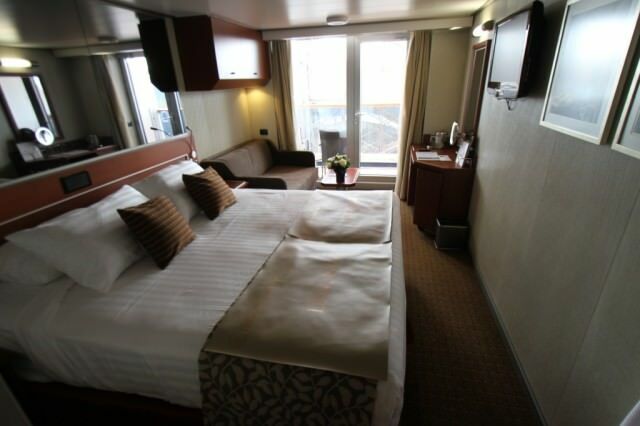 Staterooms are roomy by ship standards. The first of the fleet’s Signature-class vessels, HAL put cabins on upper decks for the first time and introduced a collection of spa staterooms with special amenities, including aromatherapy bath salts, yoga mats, pedometers and a special healthy room-service menu with fresh squeezed fruit and vegetable juices, egg white omelets and other items. As on the rest of the fleet, standard outside cabins are a roomy 185 square feet and décor marries organic colors with wood veneers, nickel and stainless steel touches to create a modern look. All categories boast the line’s Signature of Excellence features, from Euro-top beds to Egyptian cotton towels, flatscreen TVs and DVD players, massaging shower heads, mini fridges, and Elemis toiletries. 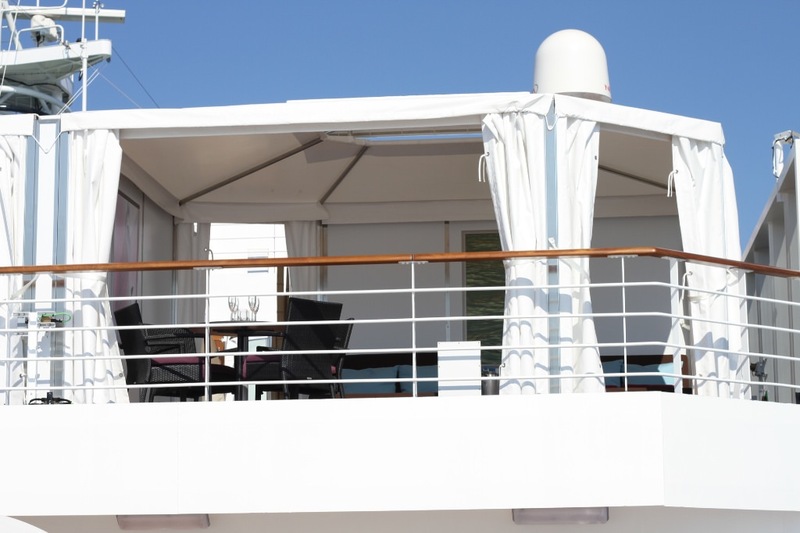 On July 4, 2010, I boarded Nieuw Amsterdam for inaugural ceremonies in Venice. When compared to Holland America Line’s Eurodam, there wasn’t a whole lot new about Nieuw Amsterdam. In fact, stepping aboard Nieuw Amsterdam last week in Venice felt much like stepping aboard Eurodam two years ago in Rotterdam. That’s not such a bad thing. Indeed, Holland America Line continues to steer the course during an age when other companies are introducing ships with headline-grabbing innovations — grass lawns and restaurant complexes on Celebrity, entertainment megaplexes on Oasis and Epic. Holland America Line’s Signature-class ships are traditional mid-size vessels with a mix of the tried-and-true. “It’s part of the beauty of Holland America Line, consistency as we build classes of ships,” says HAL President and CEO Stein Kruse. The key difference between the ‘Nieuw’ ship and Eurodam is in the decor. Nieuw Amsterdam reflects New York City (known, of course, as Nieuw Amsterdam to its Dutch founders.) There’s even a New York City Checker Cab and a hot dog stand (nonfunctioning) in Club HAL. There is a new wine pairing dinner called the Master Chef’s Table, which offers a special evening in a semi-private room in the Pinnacle Grill and features seven courses served on signature Versace plates. With deck plans from Holland America Line’s Eurodam, you could easily find your way around Nieuw Amsterdam. See Nieuw Amsterdam, Deck By Deck. 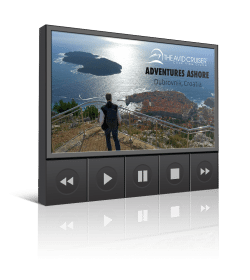 Want Help With Your Holland America Line Cruise? 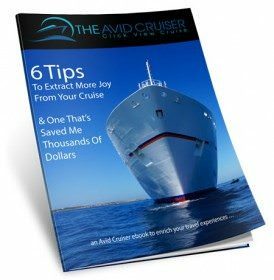 Avid Cruiser Posts, Photographs and Videos Featuring Nieuw Amsterdam. 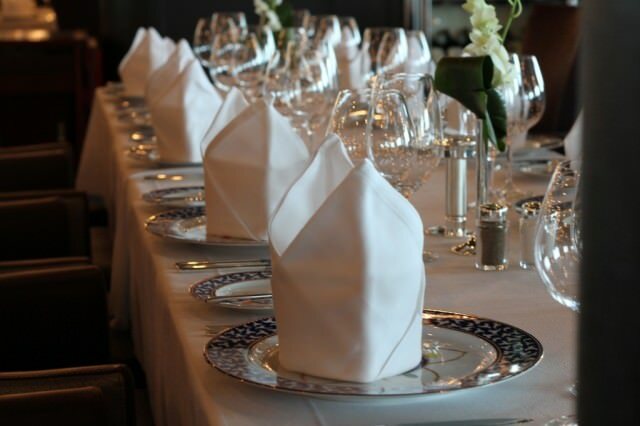 Top Ten Specialty Restaurants at Sea: Where Will You Dine Tonight? We have already booked on the Nieuw Statendam for july 28 sailing the viking saga route. We’ll be traveling with our kids, girls 16 and 13 and boy 13. Since it is a busy season, I would like to make reservations for shows and “Americas Test Kitchen” workshops well in advance. Can you recommend the best times and days to do these activities? do you know any other activities that may be of interest to them on the ship? Are there any onshore excursions that may be attractive to the kids?